Home News Pound surges to a six-month high against the euro as markets give a thumbs-up to Brussels Brexit deal. Pound surges to a six-month high against the euro as markets give a thumbs-up to Brussels Brexit deal. 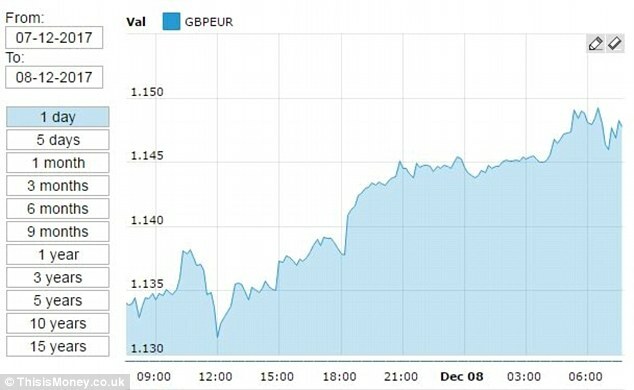 The pound surged to a six-month high against the euro this morning as markets signalled their approval of the historic Brexit deal struck in Brussels in the early hours. 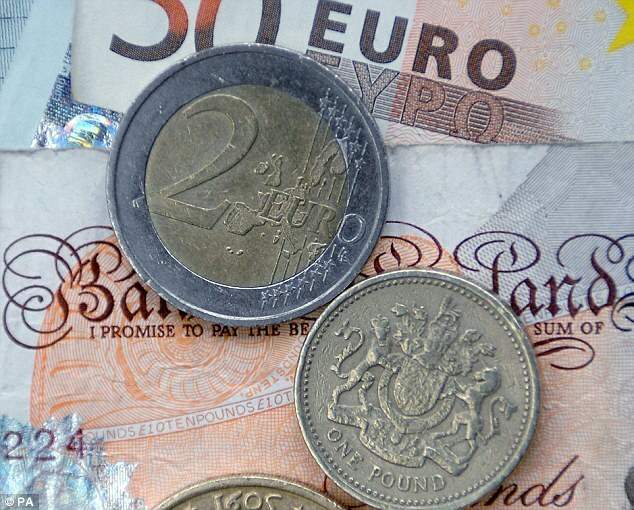 Currency traders bought sterling, sending it to €1.151, after the European Commission's announcement that 'sufficient progress' had been made in the first phase of Brexit talks lifted some of the economic uncertainty that had been weighing on the UK currency. That was a gain of 1.5 per cent from yesterday's low of €1.131, and the highest level for sterling against the single currency since June. Relief rally: The Brexit deal has sent the pound to six-month highs against the euro. The pound had made gains overnight against the dollar to trade above $1.35. 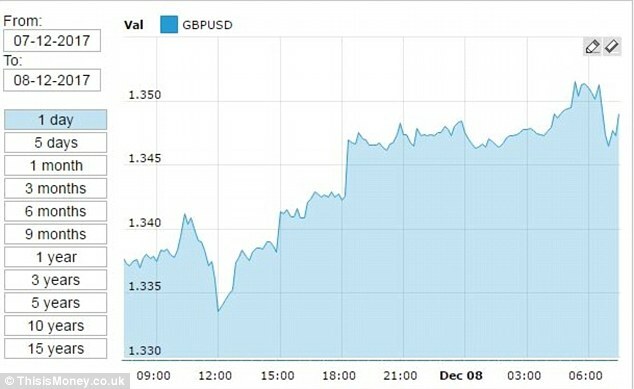 As traders tried to digest the implications of the May-Juncker deal for the UK economy, it fell back to $1.345 and then recovered to trade above $1.35 once more. Craig Erlam, senior market analyst at OANDA, said: 'The response in the pound to the announcement may come as a surprise given just how significant today's agreement is, but it's worth noting that this has been in the making over the last couple of weeks and it was in both sides' interest to get this done today. The pound gained 1.5 per cent from yesterday's low of €1.131 to the highest level for sterling against the single currency since June. As traders tried to digest the implications of the May-Juncker deal for the UK economy, sterling fell back to $1.345 and then recovered to trade above $1.35 once more. 'Had the two sides failed to come to an agreement then the downside in the pound may well have been far greater. Prime Minister Theresa May and Brexit Secretary David Davis had made an early-hours journey to Brussels to meet European Commission president Jean-Claude Juncker and the European Union's chief Brexit negotiator, Michel Barnier. 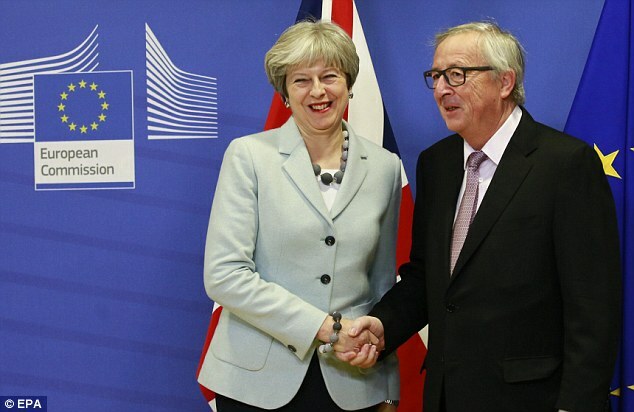 That's a deal: PM Theresa May and European Commission president Jean-Claude Juncker shake on the early-hours agreement. Business groups reacted with relief to the news. He added that two things are now 'top of the list': 'First is the final step for those EU citizens working here, and UK citizens abroad. It must be unequivocal that they are welcome, whatever the final deal. This cannot be their second Christmas where their rights are dependent on negotiations. The national chairman of the Federation of Small Businesses, Mike Cherry, said the focus 'must now shift to the UK's future trading relationship with the EU'. 'This should include, by early next year, a guarantee that there will be no cliff-edge moment on Brexit day, but instead an orderly, time-limited transition period so that small firms only have one set of rule changes,' he added. Attention will now turn to trade and Mrs May faces another race against the clock to secure a trade deal that delivers the 'exact same benefits' of the single market, which her Government has promised the British electorate. Britain is due to exit the single market and customs union in 2019.